Mobile high grade steel TV Cart (STAND-TV03E) from VIVO. Perfect for conference rooms, class rooms, or rolling around your home. The mounting brackets fit VESA 600x400 and smaller, and is designed to hold screens 30" to 65" with a max weight of 110lbs. This solid cart features a clean internal cable management system, 4 locking casters on the wheels to make the cart stationary, and an adjustable front metal shelf holding up to 30lbs. Mounting brackets allow for -15 degree screen tilt to maximize viewing angles. The total cart height reaches 60" with a base width of 34". Max TV height is 57.5" (center) and max shelf height is 27.5". Stand comes in a smooth black finish. 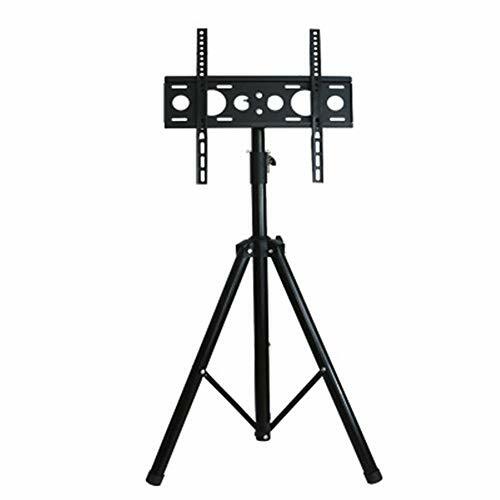 Mobile high grade steel TV Cart (STAND-TV03W) from VIVO. Perfect for conference rooms, classrooms, or rolling around your home. The mounting brackets fit VESA 600x400 and smaller, and is designed to hold screens 30" to 65" with a max weight of 110lbs. This solid cart features a clean internal cable management system, 4 locking casters on the wheels to make the cart stationary, and an adjustable front metal shelf holding up to 30lbs. Mounting brackets allow for -15 degree screen tilt to maximize viewing angles. The total cart height reaches 60" with a base width of 34". Max TV height is 57.5" (center) and max shelf height is 27.5". Stand comes in a smooth white finish. This premium rolling cart has the ability to move your TV or monitor to any room in your home or office. This unit is designed to universally fit most LED, LCD, Plasma TVs and other flat panel displays from 40" to 65". This television mount utilizes the standard VESA patterns installed in almost all flat screen TVs with a range of 100mm x 100mm up to 600mm x 400mm. The height of the display (center of the TV) is adjustable from 40" to 60" in 2" increments. Constructed from commercial-grade, heavy-duty steel, this rolling mount is rated with a capacity up to 100 pounds. A convenient, height adjustable component shelf is made to hold a cable box, game console, DVD player, or any other similar device under 10 pounds. This movable cart is loaded with safety features such as an extra wide base measuring 33" x 29" for stability and security bolts that lock your TV in place to protect against accidental shifting. The four wheels are heavy-duty casters that roll smoothly and are built with a locking mechanism on each wheel for safety and stability. Convenient openings in the upright poles and back plate provide space to pass cables and wires through for a clean and uncluttered look. Step by step instructions will guide the simple assembly and installation process. Also included is a media top shelf that height adjustable and can support a video camera, game motion sensor, or a similar item. Certifications: RoHS, CE and ISO-9001. Universal fit and compatibility for televisions from 40 - 65 in. Component shelf for cable box, DVD player, etc. Carries up to 132 lbs. Heavy-duty steel construction. Easy assembly with all necessary hardware included. Smooth swivel caster wheels with brake. 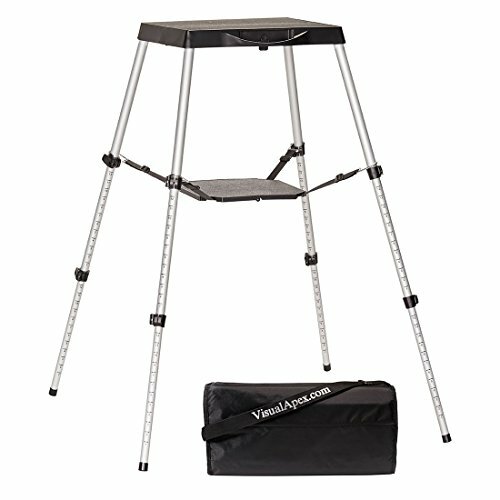 The base is 36" x 30" for extra stability. The poles are 60" high from the floor. The TV arms slide side to side to fit a wide variety of sizes. It fits up to VESA 600x400. This means the distance between the mounting holes on the back of the TV should not exceed 24 horizontally and 16 vertically. Most 32 - 70 LED LCD TVs. Adjustable heights TV mount. Max TV height is 58 (center) from the floor. The TV plate is 26 wide, Please make sure your TV or monitor is wider than 26 otherwise the plate will show behind it. Tilts down for optimum viewing angle and to reduce glare. Adjustable heights 19 X 12 metal shelf with 25 lbs weight capacity perfect for media player, notebook or any other equipment that needs a flat surface. Max shelf's height is 27 from the floor. Integrated cable management channel inside the tube for neat display. 25 Year manufacture Warranty. Comes with instruction and all necessary hardware. Note: the TV screw sets provided are of standard size. They will fit the majority of TVs on the market. Should your TV require a different sized screw; the size can be established through the TV User Manual and can then be purchased from your local hardware store.Please reach out to us if you have any problems at all. Mobile high grade steel TV Cart from ABCCANOPY. Perfect for conference rooms, class rooms, or rolling around your home. The mounting brackets fit VESA 600x400 and smaller (minimum VESA 50x50), and is designed to hold screens 32" to 65" with a max weight of 110lbs. 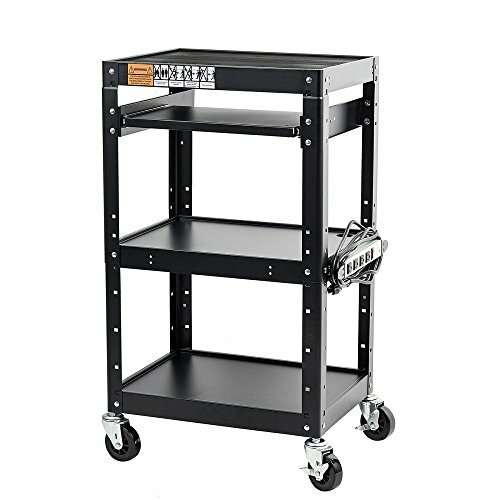 This solid cart features a clean internal cable management system, 4 locking casters on the wheels to make the cart stationary, and an adjustable front metal shelf holding up to 30lbs. Mounting brackets allow for -15 degree screen tilt to maximize viewing angles. The total cart height reaches 60" with a base width of 34". Max TV height is 57.5" (center) and max shelf height is 27.5". Stand comes in a smooth black finish. This mounting brackets fit VESA 600x400 and smaller (minimum VESA 50x50), and is designed to hold screens 32" to 65" with a max weight of 110lbs. Taken 45"*30" bulkhead. Have one upper baffle and tray. Locking casters on the wheels to make the cart stationary. TV Stand has a standardized screw place for the mounts. Esay to assemble, came with tools need. And an adjustable front metal shelf holding up to 30 lbs. Holds laptops, DVD players, streaming devices, and other equipment. This solid cart features a clean cable management system, zip tied a surge protector with a long cable to it, so everything is neat plugged in and can be moved or relocated with no hassle. Mounting brackets allow for -15 degree screen tilt to maximize viewing angles. The total cart height reaches 48.5 with a base width of 34.Max TV height is 57.5 (center) and max shelf height is 27.5. Enjoy life to the fullest extend. Play video game with your family on desktop computer while sitting on the recliner in the living room, or roll it to away to a bedroom if needed. Top-grade mobile TV Stand TS1881 has a modern sleek design so it perfectly suits your interior. It is suitable with TVs with diagonal from 55'' - 80 inches. The mounting brackets fit VESA mounting holes from 200 x 200 mm (min) to 800 x 500 mm (max). Just check these holes on your TV. Engineered to the high level standards using cold rolled box section carbon steel (SPCC), our TV cart provides stable and durable support for your TV with a max weight of 200 lbs. It is a great solution for your home, office, business, classrooms, boardrooms or conference rooms. You can easily adjust the height of your TV from 61" to 65 inches (floor to center of your TV) and watch films, shows, play games in the most comfortable positions. Due to integrated cable management design, you can keep cables and wires hidden inside TV stand columns. This rolling TV Cart is equipped with locking casters wheels for easy moving, you can lock them to fix the cart on the spot. Our updated TV Stand with wheels now comes with 2 sturdy middle shelves with a load capacity of 25 lbs (each) for cable boxes, Xbox, PlayStation or any other audio/video equipment you use. TV stand TS1881 by ONKRON has all needed hardware and a comprehensive product installation manual. 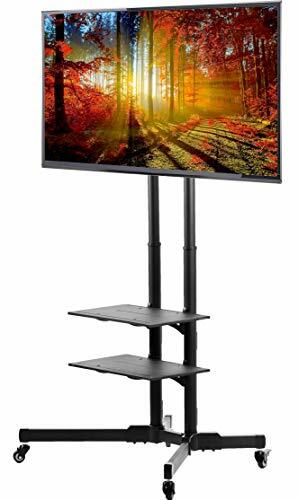 This universal mobile TV Stand with mount is compatible with most 32"-65" Flat and Curved Panel LED, LCD, and Plasma TVs on the current market. 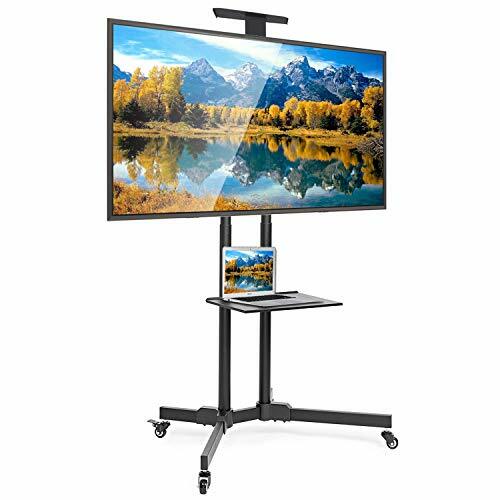 The rolling universal black steel TV cart offers a great solution for business presentations, educational sessions or any other information sharing venues. This cart allows you to hold teleconference meetings or just display information in any location with an electric outlet. The tv stand can be used in conference rooms, at expos and tradeshows, as well as in classrooms. Besides, you can always mount your computer monitor on the stand and enjoy a video game. All in all, this mobile tv stand will meet your needs whatever they are. Whether you own or rent, avoid putting holes into your walls and use a TV Cart instead. The cart is equipped with 4 brake castors which allow you to roll it from one room to another your house and provide stable fixation of your tv screen on site. Mount-It! MI-876 universal mobile TV cart with one shelf for commercial and home use. Ideal for conference rooms, schools, hospitals and trade shows. Avoid holes in your walls and use a TV Cart instead. You can roll it from one room to another or roll it outside to your porch, pool, or backyard. The quality black finish matches most flat screen TVs in their home or office environment. Easy to assemble or disassemble. The TV mount is suitable for TVs from 37 to 70 inches. TV size is provided as an estimate and compatibility of the TV should be verified by checking the bolt hole pattern behind the TV. This mount has adjustable arms and can accommodate bolt hole pattern of VESA 600x400 or smaller. The TV cart has one durable shelf to help carry AV equipment, such as DVD players, laptop computers, cable top boxes or audio components. The shelf is heavy duty with 22 lbs capacity. The assembly can carry a total of 110 lbs load. - Shelf dimensions: 19 in wide, 11.5 in deep. - TV Compatibility Check: Bolt holes behind the TV should be less than 23.6 inches wide and 15.7 inches high. 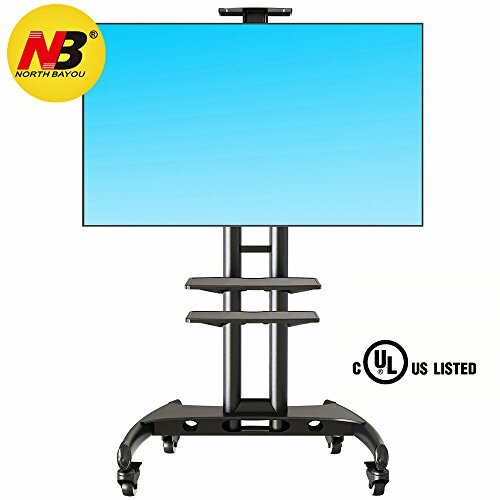 UNIVERSAL MOBILE TV CART - Portable LCD, LED, Plasma, 4K Mobile TV stand designed specifically for indoor, outdoor, industrial, office, school, hotel, airport, laboratory, lobby and church use. PREMIUM MATERIALS - Made from premium steel column and legs, durable plastic shelf and heavy-duty metal caster wheels. 110 Lbs capacity. TV bracket is height adjustable. COMPATIBLE WITH ALL TVs - Universal TV wall mounting bracket fits most of 37-70 LCD/LED/Plasma TVs on the market up to VESA 600x400 and weighing up 110 lbs (Fits VESA 600x400, 600x200, 400x400, 400x300, 400x200, 300x300, 200X200 mm). AV COMPONENT TRAY - Height adjustable shelf supports DVD players, DVRs, HD recorders, Cable TV Boxes, AV components, gaming systems or camera for videoconferencing. ULTIMATE PORTABILITY - Simple to travel with, easy to disassemble. Simple construction allows easy installation. Casters swivel for maneuverability and smooth positioning. Comes with hardware for the stand set up, as well as to install TVs to the mount. Brand: Mount-It! | Manufacturer: Mount-It! Newer high-quality metal rolling TV cart with mount by ONKRON TS 15-51 is a universal mobile TV stand for most television models and brands on todays' market. Fits LCD, LED, OLED, Ultra HD, plasma, curved and flat panel screens and monitors with diagonal screen sizes between 32 inch and up to 65'' max weighting up to 100 lbs. Please check your TV's back panel for VESA mounting holes - this model mounting brackets are compatible with VESA standards from min 200 x 200mm and up to max 600 x 400 mm. It is easy to assemble or disassemble; comes with set up instructions and 3 sets of most popular bolts for mounting your screen - please pick yours carefully referring to your model TV manual if needed. Easy to maneuver television stand is a perfect combination of functional design, quality and value. Heavy-duty steel frame with height-adjustable TV mount brackets, steady base with 4 lockable caster wheels and 2 AV shelves for media accessories - one under the monitor with load capacity of up to 25 lbs for audio video equipment, receivers, gaming accessories or laptop, and a smaller one on top, with additional 10 lbs capacity weight. 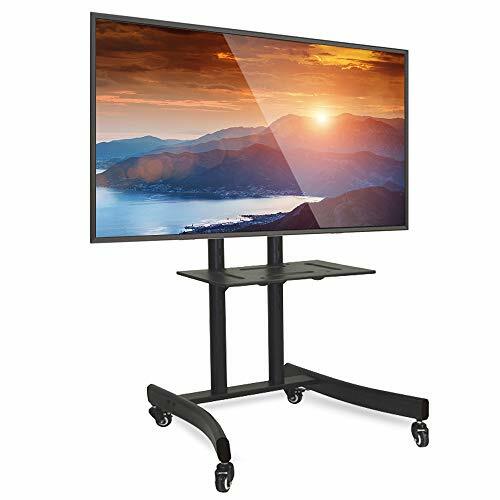 Mounting television screen on a portable cart is an easy and smart solution for big and small businesses, conference rooms and boardrooms, classrooms, professional, non-profits and community organizations, expos, trade shows, educational and entertainment venues. Imagine spot on marketing, information sharing, streaming, telecommuting, teleconferencing possibilities. Connect and display any information in any space with electrical outlet. Modern solution for hoteling work stations, gaming and home entertainment. Perfect way out to avoid permanent TV wall installation and have television set handy where you need it - any room in the house, outside, in rental apartment, converted garage, game room. Great for entertaining company in your back yard or enjoying outside living. Smart solution for your smart TV! This ergonomic sit stand computer desk allows you to raise and lower your work surface quickly and effortlessly to healthy sit-stand heights so you can work comfortably. The portable computer desk features a durable powder-coated steel frame, height adjustable table top, keyboard tray and two utility shelves. The four-wheel caster base means this desk can be moved easily with two locking wheels function for secure placement. Its ergonomic, portable, space saving attributes make it an attractive choice in all types of businesses, office, trade-shows, mall kiosks, retail stores, factories, schools, hospital even at home. 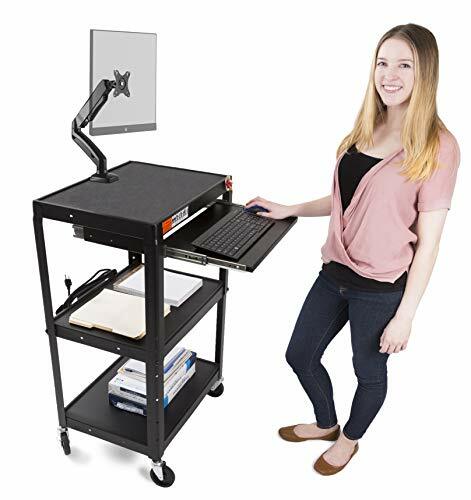 The Pearington mobile AV & presentation cart provides an excellent multipurpose solution for personal or professional needs. This multipurpose cart is commonly used for schools, nursing homes, hospitals, colleges, libraries & many other functions. The cart is commercial grade and features adjustable shelf heights in order to accommodate presentation/product supplies; each shelf with a capacity of 110Ibs. There is also an additional, retractable keyboard shelf. For easy transport and mobility, the cart comes with 4 easy glide wheels placed on the bottom legs of the stand. There is also a convenient power strip with 4 outlets and a 12 cord. The cart measure 24"w x 18"d x 42"h.
DURABLE VERTICAL LAPTOP STAND- Constructed of solid steel with three adjustable storage shelves, including an additional keyboard shelf; Per shelf capacity is 110Ibs. New TV cart from VIVO. Great for conference rooms, schools, and hospitals. The stand is black and made from high grade steel. The mounting bracket can be set at 3 different heights 50.5", 54" and 57" (from floor to center of TV). 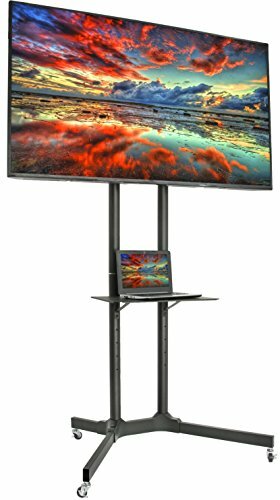 The stand has a max center screen height of 57"
The wheel base is 26" x 34.5". Included are 2" casters (2 locking) for easy mobility. There are two bottom shelves that measure 11.5" x 19" for DVD/Blu-ray players, steaming devices, AV equipment, and more. Both are height adjustable between 15" and 25" from the floor. Note: Max load capacity is 100 lbs. 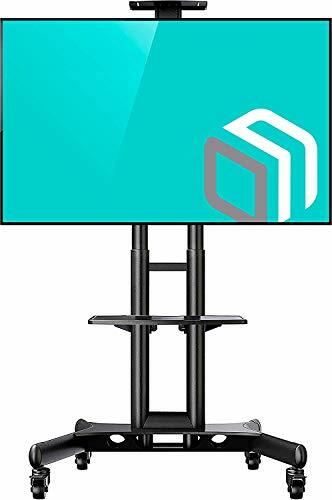 Visual Apex has a patented designed of the Portable Projector Stand to meet the varying needs of our Projector and Projector Screen customers, creating a versatile solution for a wide variety of uses - Business projector presentations to Backyard Home Movies. Lightweight, portable design, telescoping locking legs provide quick and easy set up everywhere from classrooms to conference rooms to your living room - even for outdoor events. It folds down into a convenient carry case for portability and storage. The optional accessory shelf can hold small media players and/speakers up to 5lbs. Stand supports 44lbs total. The All-in-One Carry Bag that is included is also designed to expand and hold your projector and accessories so you have everything in one location. Technical Specifications: Table Stand Weight: 8.8lbs. Table Top Dimensions: 15" x 17.5". Carry Bag Dimensions: 20L" x 10H" x 5W" (not extended) Carry Bag Dimensions: 20L" x 10H" x 10W" (fully extended to also hold a projector). Package Contents: (1) Portable Projector Table Stand (1) Accessory Shelf (4) Extendable Legs (1) Sturdy Carry Bag with shoulder strap for Projector and Table Stand. (1) Hex Wrench to further secure leg clamps. IMPORTANT TIP - Please use included hex wrench to tighten screws in the leg clamp, if necessary. This will prevent the telescoping leg to move when locked. Enjoy! 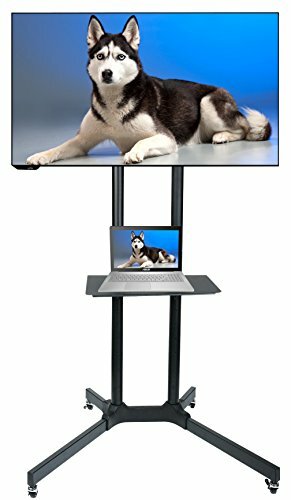 Visual Apex Projector Stand - compact and versatile design for Projector Presentations to Backyard Movies. All the pieces are stored inside its own table top! Supports up to 44lbs of total weight. The included sturdy carry bag with shoulder strap extends to also hold a portable projector, the stand, and your accessories for easy transport. Height adjustable quick lock legs, adjust from 18.5 to 44 high and each leg can be individually adjusted for uneven ground surfaces! Table top is 15 x 17.5. Accessory shelf is also included (12.5 x 12.5), Legs have numbered line increments for easy height adjustments. Projector Stand weighs less than 9 lbs. Watch Projector Stand videos on the manufacturers website! Important Tip - Please use included hex wrench to tighten screws in the leg clamp, if necessary. This will prevent the telescoping leg to move when locked. This mounting brackets fit VESA 600x400 and smaller (minimum VESA 100x100), and is designed to hold screens 32" to 65" with a max weight of 110lbs. This solid cart features a clean internal cable management system, 4 locking casters on the wheels to make the cart stationary, and an adjustable front metal shelf holding up to 30lbs. Mounting brackets maximize viewing angles. Max TV height is 57.5 (center) and max shelf height is 27.5. Oklahoma Sound manufactures lecterns, portable public announcement systems, multimedia presentation carts, microphones, and computer carts. The company, founded in 1981, is headquartered in Clifton, NJ. EXTRA SPACE: Your favorite AV cart just got more useful! Pullout laptop tray and two added drop leaf side shelves give you even more space for multiple screens, a projector, a document camera and a laptop. LOCKING CABINET: Keep all of your valuables safe as you go from room to room with our Line Leader AV Cart! Convenient lockable cabinet provides storage opportunities that other carts just don't offer! HEIGHT ADJUSTABLE: Set your cart to the perfect ergonomic height. 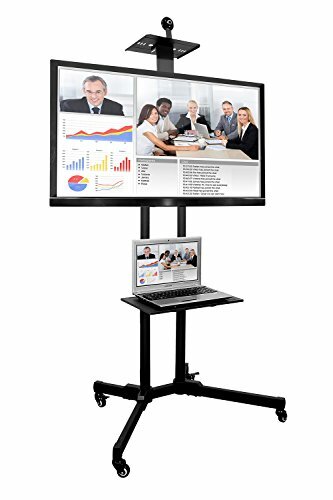 No more hunching over during presentations, stand tall with our height adjustable metal cart! EASY ROLL WHEELS: Take your cart wherever it is needed! Your new cart is great as a mobile workstation with 4 full swivel casters and two locking brakes. STURDY & SAFE: Our media carts are built to last with steel shelves that hold up to 300 lbs! Combine that with a non-slip safety mat, cord management AND a locking cabinet and our media carts are the safest on the market! 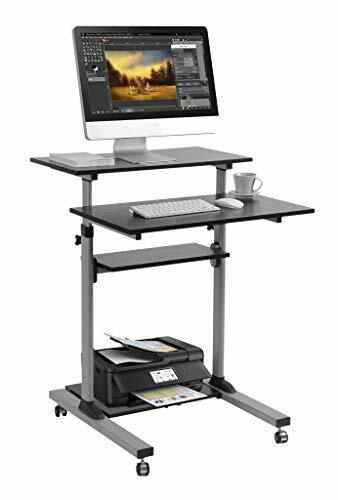 Line Leader AV Cart with Keyboard Tray and Monitor Mount | Mobile Workstation Includes Rolling Cart and Gas Assist Clamp-on Monitor Arm | Take Your Office On-The-Go with Our Stand Up Computer Cart! 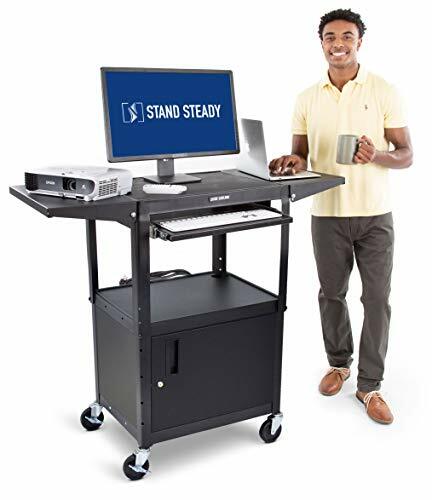 The Stand Steady Audiovisual Cart is height adjustable and is equipped with swivel wheels to easily move around. 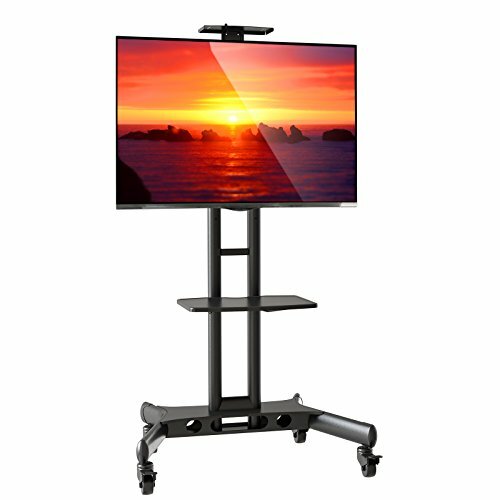 You can use this cart in any school or office setting and works great as a rolling entertainment center. Use your computer on the go! Our mobile workstation features a retractable keyboard tray that you can slide in and out, and a clamp on monitor arm so that your screen stays at eye level. It also contains shelves that can be adjusted to your perfect height for all of your storage needs! Each shelf offers plenty of space for your computer, laptop, projector and more! Gas Spring Tilt: +45 ~ - 45 Spin: 360 Rotate: +90 ~ -90 Fits Curved or Straight Monitors Weight Limit: 14.3 lbs. 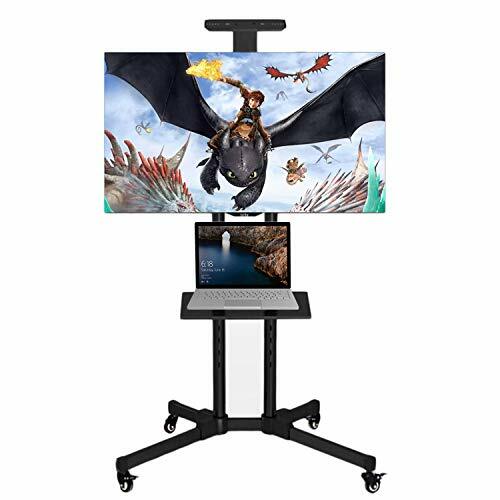 each monitor Screen Size: 13" to 27" Lowest height: 6" Tallest height: 16"
BUILT FOR STABILITY: This mobile cart is very stable and rolls easily around your home, classroom or work space! With its silent roll and full swivel caster - it can easily move where you move! With two locking breaks - your new monitor cart will stand steady wherever you choose. ADJUSTABLE HEIGHT: This multipurpose steel utility cart includes adjustable height shelves that can range from 24 inches to 42 inches (with 2 increments). Set to your ideal height for any of your audio-visual needs! SPRING ASSISTED MONITOR MOUNT: Your monitor will get full motion articulation, swivel 360 degrees, rotate +90 to -90 , and tilt at +90 to -45 , and have spring assisted height adjustments from 6 - 16 inches. Its VESA mount will fit 1 screen 13 to 27 inches in size, and up to 14.3 lbs. Portable TV Stand: This tripod TV stand is the perfect solution when you need a portable mobile TV stand, TV or outdoor TV stand. Suitable for indoor and outdoor home use, as well as commercial and industrial applications. No need to drill holes in the wall or buy expensive carts. Universal compatibility: The adjustable TV stand is compatible with all TV models with standard VESA patterns. Suitable for 32, 37, 40, 42, 47, 50, 55 inch LCD, LED and curved TV. Solid steel construction: The floor-standing TV pole bracket easily supports weights up to 15kg. The foldable tripod legs have a wide base and non-slip rubber feet for reliability and stability. Quick assembly and disassembly: This portable display stand is easy to transport and install and can be used for conference rooms, store displays, schools, and even movie nights in the backyard. 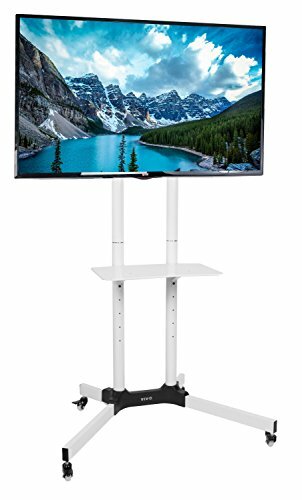 Height-adjustable TV stand: The telescopic rod can be easily lifted and lowered, with an adjustable viewing height from 43 to 68 and a downward tilt of 8 degrees to reduce illumination glare.  We try our best to ensure all of our customers can get an excellent shopping experience. Please feel free to contact us if any problems, we will reply soon.  If you do have a concern or want to return an item please contact us before opening a return case. We will offer you a satisfied solution. 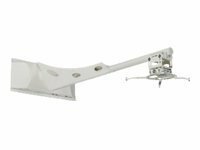 Premiers universal short-throw projector arm extends up to 67" And is crafted to support all of the latest short-throw Projectors on the market today. Offering more adjustability than any other projector arm on the market, The UNI-EPDS adjusts from 7" To 67" From the wall.